ETFLogic is introducing a new twist on the NCAA Sweet Sixteen Tournament. We have assigned ETFs to each of the 16 remaining teams based on ETFs that have exposure to “themes, sectors or companies” that one may associate with the school / state. For example, when you think of Kentucky, you may associate the Kentucky Derby which is held at Church Hill Downs Race Track CHDN. The ETF with the largest exposure to CHDN is Invesco S&P MidCap 400 Pure Growth ETF (RFG). ETFs compete on price return for the one day the game is played or the closest trading day. After each of the remaining rounds: The Sweet Sixteen Thursday and Friday, The Elite Eight Saturday and Sunday, The Final Four April 6 and The National Championship Final April 8, you will collect points based on the success of your selections. The Winner will receive a $100 Amazon gift card from ETFLogic! Duke HECO Strategy Shares EcoLogical Strategy ETF Zion Williamson’s Nike (NKE) shoe exploded while playing North Carolina in regular season. It was “kind of a big deal.” HECO is the ETF with the 2nd largest exposure to NKE. Virginia Tech JHMT John Hancock Multifactor Technology ETF As a Tech school, we decided to select a tech ETF that was not from one of the biggest Issuers, but one of the biggest growing Issuers. LSU RETL Direxion Daily Retail Bull 3x Shares When you think of Louisiana, you think of New Orleans. When you think of NOLA, you think Mardi Gras and going 3x harder than usual. We selected RETL for its exposure to Party City, PRTY. Michigan St QVM Arrow QVM Equity Factor ETF Domino’s Pizza (DPZ) is headquartered in Ann Arbor Michigan, home of Michigan State. QVM holds a good amount of DPZ. Gonzaga WOOD iShares Global Timber & Forestry ETF Gonzaga is located in Washington State. Forestry, Pine Trees come to mind hence ticker WOOD. Florida St OLD Janus – The Long-Term Care ETF Florida is often known as a retirement community hence the reason for selecting the ETF OLD with a focus on Long Term Care. Texas Tech OIH VanEck Vectors Oil Services ETF Texas is known for a lot (Lone Star, Long Horn, Football, BBQ, Oil) so this was a hard choice. We decided to go with Oil hence ticker OIH. Michigan FTXR First Trust Nasdaq Transportation ETF General Motors (GM) is headquartered in Detroit, MI. The ETF holding the largest weight in GM is FTXR. Virginia CWS AdvisorShares Focused Equity ETF Virginia is known for its peanut farming. J.M. Smucker (SJM) is known for JIF peanut butter. The ETF with highest weight in SMJ is CWS. Oregon FDIS Fidelity MSCI Consumer Discretionary Index ETF Oregon is the home of Amazon (AMZN). FDIS has significant exposure to AMZN. Purdue SCHH Schwab U.S. REIT ETF Purdue is located in Indiana. Simon Property Group (SPG) is the largest Retail Estate Investment Trust which is based in Indianapolis. SCHH is the ETF with the largest concentration in SPG. Tennessee NOBL ProShares S&P 500 Dividend Aristocrats ETF Tennessee is known for Jack Daniels Whisky which is owned by Brown-Forman (BF.A). BF.A is one of the 50 U.S. stocks that has increased its dividends for the last 25 years consecutively thus is part of NOBL. North Carolina VFH Vanguard Financials ETF Bank of America (BAC) is headquartered in Charlotte, NC. An ETF with a large holding in BAC is VFH. Auburn CSB VictoryShares U.S. Small Cap High Div Volatility Wtd ETF Auburn is located in Alabama the “Suns out, Guns out” State. The ETF holding the largest weight of gun producer, Sturm Ruger (RGR), is CSB. Kentucky RFG Invesco S&P MidCap 400 Pure Growth ETF The Kentucky Derby is held at Churchill Downs (CHDN). RFG is the ETF with largest holding in CHDN. Taking a deep-dive into ETF flows is a good way to track potential investment opportunities and keep abreast of trends in the marketplace. At ETFLogic we like to focus on flows – so let’s look at Q1 2019 stats by asset class, sector and themes. *all data listed is for time range 1/1/2019 to 4/1/2019. Fixed income inflows of $32.5bn topped equities by nearly $15bn. But equities still had the best quarter since 2009. Commodities and currency ETFs overall experienced slight outflows. We saw $17bn flow into equities over the quarter led by Vanguard S&P 500 ETF (VOO)and iShares Core MSCI Emerging Markets ETF (IEMG),each with over $5bn. The Telecommunications sector led inflows with the Communication Services Select Sector SPDR Fund (XLC)bringing in $2bn. Real Estate sector ETFs saw $3bn of inflows led by $1.4bn into Vanguard Real Estate ETF (VNQ)and $872m into iShares U.S. Real Estate ETF (IYR). Healthcare sector ETFs experienced $1bn in inflows, led by $540m into iShares U.S. Medical Devices ETF (IHI)followed by general health care sector ETFs Health Care Select Sector SPDR Fund (XLV) With inflows of $444m and Vanguard Health Care ETF (VHT)with $415m. However, the Biotechnology subsector saw major outflows, led by a $443m outflow from iShares NASDAQ Biotechnology ETF (IBB). The Consumer sector had outflows of $625m for the quarter, which might reflect on the growing worries of a global economic cooling throughout Q1. The Financial sector experienced the largest outflows of $4.6bn led by the Financial Select Sector SPDR Fund (XLF)with $2.6bn of outflows. 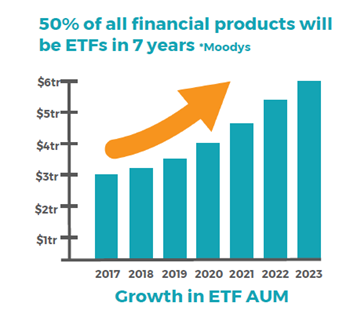 A significant $16bn of inflows into emerging markets ETFs led by iShares Core Emerging Markets ETF (IEMG) with $5bn and iShares MSCI Emerging Markets ETF (EEM)with $2.5B. The interest in emerging markets may be related to the hopes for progress in a U.S.-China trade deal. The Institute of International Finance (IIF) also predicts a recovery of emerging markets throughout 2019, fueled by loose international monetary policy. China A-Shares exposure ETF (ASHR), was near the top with $800mm inflows. With the close of the quarter we saw strong manufacturing data out of China and the U.S., which diminished investor worries about a potential global economic slowdown. The quarter closed out with significant progress in trade talks between the U.S. and China, and the President is now hinting at finalizing a deal within the next few weeks. Looking at Q1 ETF investment themes, top inflows were into ESG – totaling nearly $1.4bn. This comes as no surprise given investors are placing greater emphasis on the potential impact of their investments. The new ESG ETF Xtrackers MSCI U.S. ESG Leaders Equity ETF (USSG) led the charge with close to $900m of inflows. Infrastructure names had $109m inflows. Infrastructure is projected to continue to be a hot investment area throughout the rest of 2019. Significant outflows of $614m from Natural Resources ETFs led by United States Oil Fund (USO)with -$377m. SPDR S&P Global Natural Resources ETF (GNR) and iShares North American Natural Resources ETF (IGE)also posted over $100m in outflows in Q1. FlexShares Morningstar Global Upstream Natural Resources Index Fund (GUNR)still managed to post $70m in inflows, followed by SPDR S&P North American Natural Resources ETF(NANR)with $18m. Artificial intelligence themed ETFs saw inflows of $15m. BlackRock still holds first place but Vanguard is catching up very quicky, probably related to the “fee wars.” Interesting to see Charles Schwab and First Trust with more flows than SSGA. Other than BracketoLogic March Madness, here is what happened in ETF land last week. Investors are rallying around strong Chinese manufacturing data, and we can assume investors are shrugging off worries of a global economic slowdown due to the major outflows from precious metal and gold ETFs. China was the clear winner in returns this week, with VanEck Vectors China AMC SME-ChiNext CNXT, VanEck Vectors ChinaAMC CSI 300 PEK, CSOP FTSE China A50 AFTY, Xtrackers Harvest CSI 300 China A-Shares ASHR, KraneShares Bosera MSCI China A Share KBA, iShares MSCI China A CNYA, KraneShares CSI China Internet KWEB, SPDR MSCI China A Shares IMI XINA, and KraneShares MSCI All China Health Care Index KURE and Invesco Golden Dragon China PGJ being all China names. Precious metals the clear loser, with all bottom 10 returns to Global X Silver Miners SIL, VanEck Vectors Gold Miners GDX, U.S. Global GO Gold and Prec. Metal Miners GOAU, iShares MSCI Global Gold Miners RING, iShares MSCI Global Silver Miners SLVP, VanEck Vectors Junior Gold Miners GDXJ, Global X Gold Explorers GOEX, Sprott Gold Miners SGDM, ETFMG Prime Junior Silver SILJ, Sprott Junior Gold Miners SGDJ. Last week VelocityShares Long LIBOR ULBR took the top spot with a 5.8% return. Preferred stock names Virtus InfraCap U.S. Preferred Stock PFFA, Invesco Preferred PGX, SPDR Wells Fargo Preferred Stock PSK, VanEck Vectors Preferred Securities ex Financials PFXF, iShares Preferred and Income Securities PFF, and Invesco Variable Rate Preferred VRP also performed well last week. iShares Interest Rate Hedged Emerging Markets Bond EMBH also posted positive returns of 0.92% as investor sentiment is rising for emerging markets, as of late. High Yield was also a big winner last week: iShares Interest Rate Hedged High Yield Bond HYGH, Xtrackers High Beta High Yield Bond HYUP, Fidelity High Yield Factor FDHY, and WisdomTree Negative Duration High Yield Bond Fund HYND. International Treasury Bond ETFs were among the worst performers last week: SOVB, WIP, BWX, IGOV and ISHG. Maybe a negative sentiment still remains around a potential global economic slowdown, regardless of the healthy manufacturing out of China? Inflows led by the Technology Select Sector SPDR Fund XLK, followed by iShares Core MSCI EAFE IEFA and iShares Edge MSCI Min Vol U.S.A. USMV. Vanguard Total Stock Market VTI and iShares Russell 2000 IWM with major inflows last week as last week closed out the best quarter for stocks in nearly a decade. iShares MSCI Japan EWJ also an interesting top inflow given the massive -$2.4B outflows its seen YTD. Energy Select Sector SPDR Fund XLE made top inflows despite having -1.5B outflow YTD. Outflows dominated by Invesco QQQ Trust QQQ with -$1.9B, followed by -$1.2B from Financial Select Sector SPDR Fund XLF. Outflows from ETF SPDR S&P Retail XRT and Consumer Staples Select Sector SPDR Fund XLP also follow with the recent trend of investors taking money out of consumer cyclicals as of late. Top inflows into iShares HYG for the second week running, followed by two iShares short term bond names, iShares Short Maturity Bond NEAR and iShares Short-Term Corporate Bond IGSB. Outflows were also dominated by Senior Loan ETFs Invesco Senior Loan BKLN, SPDR Blackstone / GSO Senior Loan SRLN, Highland iBoxx Senior Loan SNLN, with the majority coming out of Invesco’s BKLN. Welcome to ETFLogic’s Weekly Newsletter! In the spirit of March Madness, ETFLogic is introducing a new twist on the NCAA Sweet Sixteen Tournament. We have assigned ETFs to each of the 16 remaining teams based on ETFs that have exposure to “themes, sectors, companies” that one may associate with the school / state (making sure 16 different Issuers). For example, when you think of Kentucky, you may associate the Kentucky Derby which is held at Church Hill Downs Race Track (CHDN). The ETF with the largest exposure to CHDN is Invesco S&P MidCap 400 Pure Growth ETF (RFG). Gold and Silver were the clear winner last week, with RING, SGDM, GOAU, GDX, SGDJ, SLVP, SIL, GDXJ, and SILJ taking 9 out of 10 of the top return slots last week. This comes as investors across the globe may be fearing a sharp economic slowdown. ETFs with exposure to Regional Banks and Brazil were at the bottom. Long duration Treasury and Corporate ETFs were at the top of this weeks Fixed Income inflows. Interest Rate Hedged and Convertible Bond ETFs were this weeks biggest losers. A lot more outflows than inflows last week in Equity ETFs. Inflows led by IEFA, iShares Core MSCI EAFE. Outflows led by Vanguard Mid-Cap and Value ETFs, VO and VTV. Majority of flows into iShares Investment Grade and High Yield Corporate Bond ETFs. Longer Term Treasury Bond and Senior Loan ETFs experienced most outflows. Exchange Traded Concepts brought NETL, the NETLease Corporate Real Estate ETF to market. The fund seeks to bring investors ETF exposure to the unique and less highlighted Net Lease REIT Sector. The NET Lease REIT sector offers the potential for Income, Inflation Hedge and Growth. Last weeks top equity winners are quite diverse, including two Columbia names, 2 oil names (XES and IEZ bouncing back up a bit from last weeks significant ~7% losses), marijuana, Austria, Greece, and in honor of Women’s History month SHE – the SPDR SSGA Gender Diversity Index. Taking a look at last weeks worst performers, Gold and Precious Metal ETFs seem to be the biggest loser with GDXJ, SILJ, GOEX, RING, GDX, SGDJ, SGD all posting at least -2%. Also two major China names ASHS & CNXT made top losers as China’s economic slowdown remains a top concern to investors across the board. Emerging Market debt ETFs dominated the winners this week,  led by FEMB First Trust Emerging Markets Local Currency Bond ETF. Longer duration U.S. fixed income ETFs were at the bottom including five Treasury names (VGLT, SPLT, TLT, EDV, ZROZ) as 10-year treasury yields  hit 2019 lows last week. Last week saw huge equity inflows of $20B; with VOO, SPY, IVV, and QQQ making up a whopping 70% of that. While there were no strong trends in worst performers, top outflows came from two sectors in particular: technology (XLK and VGT) and Industrials (DIA and XLI). Other names included small cap value IJS, real estate VNQ, Japan EWJ, Developed Markets EFA, Total US market ITOT, and the NASDAQ US Dividend Achievers Select Index tracking Vanguard Dividend Appreciation ETF VIG. HYG led that pack last week with $845mm of inflows. IEF,  iShares 7-10 year Treasury Bond ETF, had largest outflows. Newcomer, RYZZ Capital Management, launched its first ETF today with Sunrise Capital as the subadvisor. First Trust NASDAQ Smartphone Index Fund FONE, index, ticker and objective will change, effective May 29. First Trust Heitman Global Prime Real Estate ETF PRME will be merging into the First Trust FTSE EPRNA/NAREIT Developed Markets Real Estate, FFR, by end of year. Quadruple Witching is Around the Corner! Quadruple witching! Sounds ominous. But it happens every quarter, on the 3rd Friday of the last month of that quarter (March, June, September and December). Quadruple witching occurs when index futures, stock options, stock index options and single stock futures all expire simultaneously. In addition, the date coincides with large index and ETF portfolio rebalances. This perfect storm of trading creates a lot of interesting undercurrents and opportunities. At ETFLogic, we have a special focus on factors. As a little experiment, let’s look at market adjusted factors during the February to March timeframe in 2018 and 2019. Growth and Value Factor trends in Q1 2019 are somewhat mimicking Q1 2018. Growth continues to be the Street’s favorite factor over Value. Growth has continuously outperformed while Value underperforms. Around the 32nd day of our analysis – March 16, 2018 – we see a mean reversion in this performance. You could – conceivably – expect a mean reversion in these spreads after quadruple witching on Friday – March 15, 2018 – the 30th day on the graph. The picture isn’t as neat and clean with dividends and quality factors. We see around 150-200bps of outperformance in both factors right before the 3rd Friday. Quality in 2019 seems to be following in its Q1 2018 shadow. Dividends have languished a bit, relatively speaking. With the prospect of a rising rate environment, investors have overall been less interested in equity yields. Moving to more technical factors, let’s focus in on momentum and volatility. Momentum 2018 seems to have taken us on a wild ride: outperforming over 300bps between February 1, 2018 and March 15, 2018. We see a strong mean reversion of over 200bps in the few days after. Low Volatility 2018 languished sideways throughout the period. Note, none of this is trading advice. In ETFLogic news, we have just announced the official launch of our Pages Platform! Our Pages product provides a subset of our quantitative tools and visuals to help asset managers and other financial professionals succeed in this new investment frontier. Pages can be accessed via pages.etflogic.io. In addition to having its own dedicated platform, Pages is also powering the analytics on the NYSE ETF Page. SALT Financial’s new ETF, the Salt Low TruBeta US Market Fund, LSLT, Will pay holders 50 cents for every $1,000 investedup until the first $100m in AUM or until April 30, 2020. Once the ETF passes those milestones, it will charge a fee of 29bps. ETFLogic TruLiquidity Report Cards are ready! 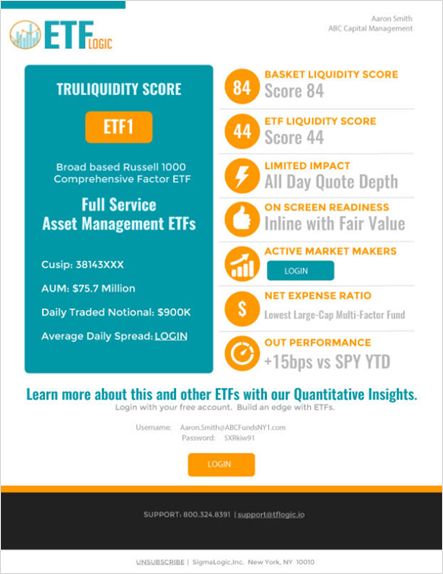 See how your favorite ETF scored. Reach out to our sales team for a customized report on any number of ETFs. We bring together trading insights and ETFLogic analytics into a one-pager. With a quick glance, you get see historical bid-ask spreads, best time of day to trade, compare with peer group names, get a basket pre-trade impact snapshot and estimate factor exposures. We look back at last week’s flows, provide details on new ETF launches and include a timely data point or tool from the ETFLogic Insights Platform. FDA Commissioner, Scott Gottlieb, just resigned. Michael Bloomberg announces he is not running for President, Tesla stock is sinking on news that China is blocking some imports, Beverly Hills 90210 heart-throb passes and Goldman Sachs is relaxing its dress code. Salt Low truBeta US Market ETF LSLT will track an index of US large cap companies predicted to have lower beta.Xtrackers MSCI USA ESG Leaders Equity ETF USSG DWS is buffing up its ESG fund line, listing a US focused ESG ETFSoFi Gig Economy ETF GIGE full time work, and the benefits it comes with is a thing of the past this ETF believes. GIGE will track companies set to benefit from insecure and precarious labor via the “gig economy”. Going through the investment strategy, GIGE is mostly interested in companies developing apps. Procure Space ETF UFO will track companies that get 50% of their revenue from space-related business. While sounding out of this world, the fund will mostly focus on satellites, with two-thirds of the funds’ constituents work with satellite technology. General Electric GE stock fell almost 5% today as the CEO expects negative industrial free cash flow this year. Check out ETFLogic‘s “Ticker Reverse Lookup” tool to determine what ETFs have the highest exposure to GE. Explore a selection of ETFLogic‘s tools and analytics on the Explore Insights Platform. Click Here to get access! On Sunday President Trump announced that he would be pushing back his original deadline to increase tariffs on nearly $200 billion in Chinese goods after a week of trade talks between US and China officials. And with Trump off to Vietnam to meet North Korean leader Kim Jung Un tomorrow, we can only hope there is more good news of peace to come. And while only time will be able to tell how this will all play out for the market in the future, we can definitely share how ETF’s played out in the past (specifically last week). 9 of the top 10 performing US listed Equity ETFs were China related. To explore a selection of ETFLogic‘s tools and analytics on the Explore Insights Platform, click here to get access! Follow us on Twitter @ETFLogic or our Company LinkedIn page for regular updates and insights taken directly from the ETFLogic platform.